Many of your clients and patients have heard the adage that “breakfast is the most important meal of the day,” but how many of them actually take it to heart? According to a survey conducted by the International Food Information Council Foundation, 93% of Americans agree with that statement, yet fewer than one-half eat breakfast regularly. So just how important is eating breakfast to good health? Studies clearly show that the breakfast meal can contribute important nutrients such as calcium, protein, and fiber to the diet. According to the USDA, breakfast provides more nutrients to children’s diets, relative to its calorie content, than lunch or dinner. In addition, study after study suggests that eating a nutritious breakfast offers health benefits that range from improved concentration to a reduced risk of obesity and diabetes. Studies consistently show that skipping breakfast can have negative health consequences for children, adolescents, and adults. Breakfast skippers generally fail to make up for the nutrients they miss at breakfast. 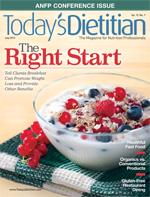 As a result, those who eat breakfast have better overall eating habits, compared with those who don’t eat breakfast, and have higher intakes of protein, calcium, vitamin C, zinc, iron, and fiber and lower fat intakes.1,3,4 In fact, calcium and fiber were identified as “nutrients of concern” in the 2010 US Dietary Guidelines for Americans. Carol O’Neil, PhD, MPH, RD, LDN, a professor at Louisiana State University and breakfast researcher, says children and adolescents should be provided with and encouraged to eat healthful food options such as whole grains, fruit, vegetables, low-fat dairy, and lean protein. “These foods should be available and children and adolescents should know how to prepare them if necessary,” she says. Moreover, studies show that skipping breakfast is associated with markers of insulin resistance.7 One study found that men who skipped breakfast had a 21% higher risk of developing type 2 diabetes compared with men who ate breakfast.8 The 2010 Dietary Guidelines pointed out that consuming a nutrient-rich breakfast is associated with weight loss and weight-loss maintenance, and according to the National Weight Control Registry, almost eight in 10 adults who maintain a weight loss of at least 30 lbs for at least one year eat breakfast every day. Several studies also have found that children and adolescents perform better in school if they eat breakfast, but according to O’Neil, not all the studies have been well designed, so the jury still may be out on that conclusion. She says the same is true for adults, who have been studied even less. But she still emphasizes the importance of eating a healthful breakfast each morning to ensure kids and teens perform well in school. A recent review of breakfast studies found that, among those who eat breakfast, ready-to-eat cereal and dairy foods were the most commonly consumed breakfast items.9 That covers plenty of nutrition territory, since cereals can range from low-sugar, low-sodium, high-fiber, whole-grain options to those laden with salt and sugar and little or no whole grains or fiber. The same goes for dairy products. Low-fat or fat-free milk and yogurt are healthful additions to any breakfast menu, but full-fat, sugary yogurts or dairy drinks can start the day off on the wrong foot. While kids typically prefer high-sugar cereals, a recent study published in Pediatrics found that children generally will eat low-sugar cereals when offered. It’s true that eggs are one of the most concentrated sources of cholesterol in the diet (185 mg per large egg), but the 2010 Dietary Guidelines determined that research overwhelmingly indicates that consuming one egg per day doesn’t increase the risk of heart disease in healthy people. A recent study found that a breakfast containing 35 g of high-quality protein from beef and eggs resulted in changes in hunger- and satiety-stimulating hormones that control food intake.10 And Leidy says, “Our recent pilot study found that 12 weeks of eating a high-protein breakfast reduced daily intake by 400 kcal.” She and her colleagues are exploring whether smaller amounts of protein will have similar effects on appetite and calorie intake. If limiting dietary cholesterol is a priority, there are several egg substitute and egg-white-only products that provide the high-quality protein of eggs without the cholesterol, but they lack the choline, lutein, and vitamin D found only in the egg yolk. Dairy foods are the primary source of calcium, potassium, magnesium, phosphorus, vitamin D, and protein in Americans’ diets.23,24 NHANES data show that milk is the No. 1 source of calcium, vitamin D, phosphorus, and potassium in the diets of children aged 2 to 18 and the No. 1 source of protein in the diets of children aged 2 to 11. The 2010 Dietary Guidelines recommend increased intake of low-fat and fat-free milk and milk products, and recommends that children aged 4 to 8 get 21/2 cups per day and that older children, adolescents, and adults consume 3 cups per day. Breakfast is an opportunity for kids, adolescents, and adults to consume more low-fat and fat-free milk and yogurt. • Make low-sugar cereals more appealing to children and adolescents by adding a small amount of table sugar and fresh fruit. • Add dried cranberries or fresh blueberries to oatmeal. • Stir in low-fat granola, sliced almonds, chopped pecans or walnuts, or ready-to-eat cereal into low-fat or fat-free yogurt. • Add low-fat or reduced-fat cheese to eggs, egg whites, or egg substitutes. • Mix raisins and wheat germ with low-fat cottage cheese. • Make a breakfast wrap with a whole wheat tortilla, scrambled eggs, shredded low-fat or reduced-fat cheese, and salsa. • Choose a whole grain cereal, top it with reduced-fat granola for sweetness, and pour on low-fat or skim milk. • Eat dinner or lunch leftovers or any high-protein, low-fat, low-sugar food that seems appealing. • Vegetarians can choose a whole grain cereal with calcium-fortified soy, almond, or rice milk. 1. Nicklas TA, Morales M, Linares A, et al. Children’s meal patterns have changed over a 21-year period: the Bogalusa Heart Study. J Am Diet Assoc. 2004;104(5):753-761. 2. Siega-Riz AM, Popkin B, Carson T. Trends in breakfast consumption for the children in the United States from 1965-1991. Am J Clin Nutr. 1998;67(4):748S-756S. 3. Timlin MT, Pereira MA, Story M, Neumark-Sztainer D. Breakfast eating and weight change in a 5-year prospective analysis of adolescents: Project EAT (Eating Among Teens). Pediatrics. 2008;121(3):e638-645. 4. Rampersaud GC, Pereira MA, Girard BL, Adam J, Metzl JD. Breakfast habits, nutritional status, body weight, and academic performance in children and adolescents. J Am Diet Assoc. 2005;105(5):743-760. 5. Leidy HJ, Ortinau LC, Douglas SM, Hoertel HA. Beneficial effects of a higher-protein breakfast on the appetitive, hormonal, and neural signals controlling energy intake regulation in overweight/obese, “breakfast-skipping,” late-adolescent girls. Am J Clin Nutr. 2013;97(4):677-688. 6. Kant AK, Andon MB, Angelopoulos TJ, Rippe JM. Association of breakfast energy density with diet quality and body mass index in American adults: National Health and Nutrition Examination Surveys, 1999-2004. Am J Clin Nutr. 2008;88(5):1396-1404. 7. McCrory MA, Howarth NC, Roberts SB, Huang TT. Eating frequency and energy regulation in free-living adults consuming self-selected diets. J Nutr. 2011;141(1):148S-153S. 8. Mekary RA, Giovannucci E, Willett WC, van Dam RM, Hu FB. Eating patterns and type 2 diabetes risk in men: breakfast omission, eating frequency, and snacking. Am J Clin Nutr. 2012;95(5):1182-1189. 9. Mullan BA, Singh M. A systematic review of the quality content, and context of breakfast consumption. Nutr Food Sci. 2010;40(1):81-114. 10. Westerterp-Plantenga MS, Nieuwenhuizen A, Tomé D, Soenen S, Westerterp K. Dietary protein, weight loss, and weight maintenance. Annu Rev Nutr. 2009;29:21-41. 11. Giovannini M, Verduci E, Scaglioni S, et al. Breakfast: a good habit, not a repetitive custom. J Int Med Res. 2008;36(4):613-624. 12. Cho S, Dietrich M, Brown CJ, Clark CA, Block G. The effect of breakfast type on total daily energy intake and body mass index: results from the Third National Health and Nutrition Examination Survey (NHANES). J Am Coll Nutr. 2003;22(4):296-302. 13. Williams CL, Felt-Gunderson P. Analysis of average daily fiber intake among ready-to-eat cereal consumers: role of whole-grain cereals in closing the fiber gap. Am J Life Med. 2013;Epub ahead of print. 14. McKeown NM, Jacques PF, Seal CJ, et al. Whole grains and health: from theory to practice—highlights of the Grains for Health Foundation’s Whole Grains Summit 2012. J Nutr. 2013;143(5):744S-758S. 15. Djoussé L, Gazaiano JM. Breakfast cereals and risk of heart failure in the Physicians’ Health Study 1. Arch Intern Med. 2007;167(19):2080-2085. 16. Costabile A, Klinder A, Fava F, et al. Whole-grain wheat breakfast cereal has a prebiotic effect on the human gut microbiota: a double-blind, placebo-controlled crossover study. Br J Nutr. 2008;99(1):110-120. 17. Fardet A. New hypotheses for the health-protective mechanisms of whole-grain cereals: what is beyond fibre? Nutr Res Rev. 2010:23(1):65-134. 18. Zeizel SH, da Costa KA. Choline: an essential nutrient for public health. Nutr Rev. 2009;67(11):615-623. 19. Leidy HJ, Bossingham MJ, Mattes RD, Campbell WW. Increased dietary protein consumed at breakfast leads to an initial and sustained feeling of fullness during energy restriction compared to other meal times. Br J Nutr. 2009;101(6):798-803. 20. Leidy HJ, Racki EM. The addition of a protein-rich breakfast and its effects on acute appetite control and food intake in ‘breakfast skipping adolescents. Int J Obes (Lond). 2010;34(7):1125-1133. 21. Pereira MA, Erickson E, McKee P, et al. Breakfast frequency and quality may affect glycemia and appetite in adults and children. J Nutr. 2011;141(1):163-168. 22. Vander Wal JS, Gupta A, Khosla P, Dhurandhar NV. Egg breakfast enhances weight loss. Int J Obes (Lond). 2008;32(10):1545-1551. 23. Rafferty K, Heaney RP. Nutrient effects on the calcium economy: emphasizing the potassium controversy. J Nutr. 2008;138(1):166S-171S. 24. Cotton PA, Subar AF, Friday JE, Cook A. Dietary sources of nutrients among US adults, 1994-1996. J Am Diet Assoc. 2004;104(6):921-930.